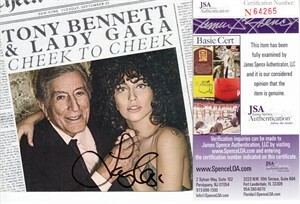 Tony Bennett & Lady Gaga Cheek to Cheek CD booklet autographed in black Sharpie by Lady Gaga ONLY (not Bennett). Obtained from promotional signing. Authenticated by JSA with their matching numbered sticker on the back and certificate of authenticity card and photo from the signing. CD IS NOT INCLUDED.